Those of you who have been reading for a while know that I have published four books with water color artist Ann Engelhart, including the latest, Adventures in Assisi. The story of our collaboration goes back years – probably to about 2006 or 7, I’m thinking, when we were still living in Fort Wayne. I received an email from this artist from Long Island who said she’d been reading my blog for a long time and that she, like I, had been profoundly affected by the papacy of Pope Benedict XVI. She had read a dialogue Benedict had held with First Communicants in Rome and thought that the conversation would make a wonderful children’s book. Would I be interested in working with her on it? I have to be honest with you and admit that I did procrastinate in answering her first and subsequent emails. I had a lot on my plate, Michael was a baby, we were talking about moving. But Ann, thank goodness, is persistent! Then one day, I had a brainstorm, and wrote to the good folks at the Catholic Truth Society in England. I think the Pope’s visit there had just been announced. They loved the idea, and I kid you not, they had the book out and in print and available within probably five months. And they did a beautiful job with the layout and reproduction of the art, with no trouble at all. It was amazing, and I’m still impressed when I look at the book’s interior. What she is giving him, in addition the mock up of the entire book, is one of the paintings she did in which she superimposed an old image of Joseph Ratzinger at his First Communion over a contemporary scene of Bavaria. So we arrived at 8am the next morning and showed the paper to the Swiss guard who kept sending us closer and closer to the platform. When we got to the special section a tuxedoed man checked a list and looked us over and then said “Two of you can sit up in the prima fila and kissa da pope”. We were stunned! The security was very tight and they kept checking their lists to see that everyone was seated in the proper seats. Archbishop Harvey paced back and forth consulting with various people in anticipation of the pope’s arrival. Finally, a helicopter (on route from Castelgandolfo) flew over the crowd and everyone cheered. The audience was filled with the joy of Easter and was special because it was the day before Benedict’s birthday and near to his anniversary. There was lot’s of flag waving and singing in several languages and German oompah bands. The English speaking pilgrims who had been the most reserved began to sing Happy Birthday and everyone else joined in in English. The pope stood and did his customary open arm wave and bow. Then it was time for greeting the cardinals, then bishops and the prima fila. Governor Bill Richardson was there and was among the first to be greeted. I was really nervous and had tried to come up with a sentence that would get the point across in as few words as possible. I opened the book to the first page with Benedict hugging the child ( I later regretted that I hadn’t opened it to the page with Jesus walking with the children) and I had the print of his First Communion in my hand. He was talking to a German family with four boys who were next to us. He definitely spent the most time with the children. My husband and I were very surprised at how he took his time with everyone…never giving the sense of being rushed. So Benedict walked over to me, smiling and I kissed his ring. I didn’t introduce myself or my husband…didn’t say where we were from… or anything. I just kept to my script. ” Your Holiness, these are some prints of some paintings I did based on your catechesis with First Communicants” He took my hand and placed his other hand on the print of his First Communion. He smiled with recognition and paused and then looked at the other page. He didn’t actually say any words, he just made what sounded like an approving “hmm”. It is impossible to know what he was thinking, but I almost got the sense that he was touched and perhaps a bit embarrassed in a very humble way. That… or he was thinking, wow, this girl is really a loser (there I go again). Then he said to me “Is this your work?” (“verk”, actually), to which I responded “Yes”. Then I said “we wanted to have many people hear your beautiful words.” He again responded with a “hmmm”. He paused to look again then someone took the book from him. Benedict then put his hand towards my husband and said to me “and this is?” I responded with “this is my husband and this is my son pointing back to Mark who was dutifully taking photos all the while. I must say that he waved and really beamed at my son who looked so adorable in his jacket and tie, waving and smiling back at the pope. After that was the best moment… he grasped both of my hands and looked me right in the eyes and said so sincerely “May God bless you”. I was almost taken back with the intensity of the moment. I said “and God bless you too” in return. Then he took my husband’s hand and said the same and he responded with “Happy Birthday Holy Father”. (We had a good laugh over that later). Then Msgr. Ganswein (who really is quite charming) grabbed my hands and said “these are rosaries from the Holy Father for you and for your son” while smiling very broadly. He then gave my husband a set as well. I thanked him and said “Happy Easter”. 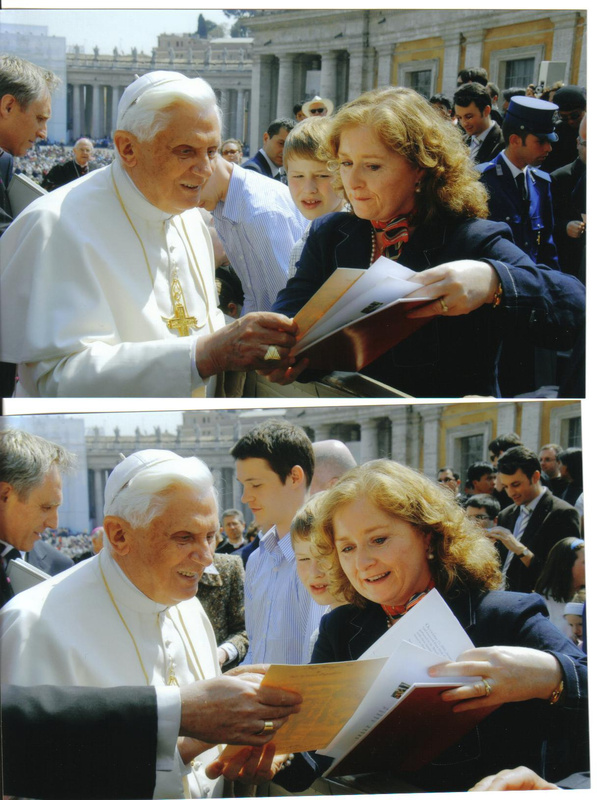 It is so funny to read the description of my little meeting with Benedict XVI of several years ago! Perhaps over time I have embellished the events in my mind…or maybe I was being somewhat modest in my description of how things happened…But I think I can honestly say (and my husband and son concur) that Benedict’s reaction was more than a “hmmm”. In fact, I would even say that it was a little gasp. Like, “oh my!” He seemed surprised and definitely laughed when he recognized himself as a little boy. Before saying “God bless you” in a very intense and personal way, he said something else to me, but sadly I couldn’t understand it! I have looked at the video many times and I can’t seem to make it out. But the words were affirming – probably something like “I appreciate what you are doing”, or “carry on with what you are doing” or “you are the finest artist the world has ever known” or “this will become the most important book of our time”. Yeah, probably something like that. So somewhere between a “hmmm” and an “oh!” I experienced an extraordinary blessing that never would have happened if I hadn’t read about that beautiful conversation that Benedict had with the little children, and Amy hadn’t answered my email. I am enormously grateful for having the opportunity to collaborate on these projects with the great hope that they will help young families on their path to “friendship with Jesus”. 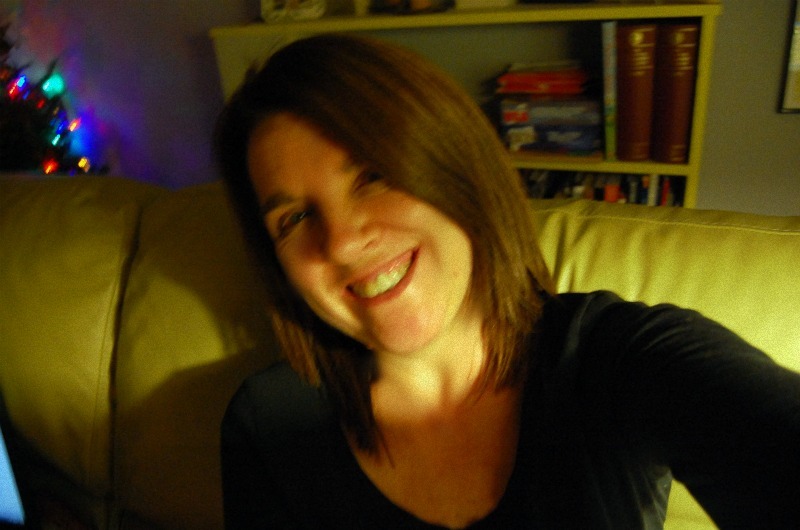 Here’s an interview with Ann at the Ignatius Press site. And another with Elizabeth Scalia. And that’s it – that’s the beginning, not only of a collaboration, but of a great friendship.